Using a typewriter brings a different kind of satisfaction than typing on a notepad. The clackity clack sound has always been music to my ears. 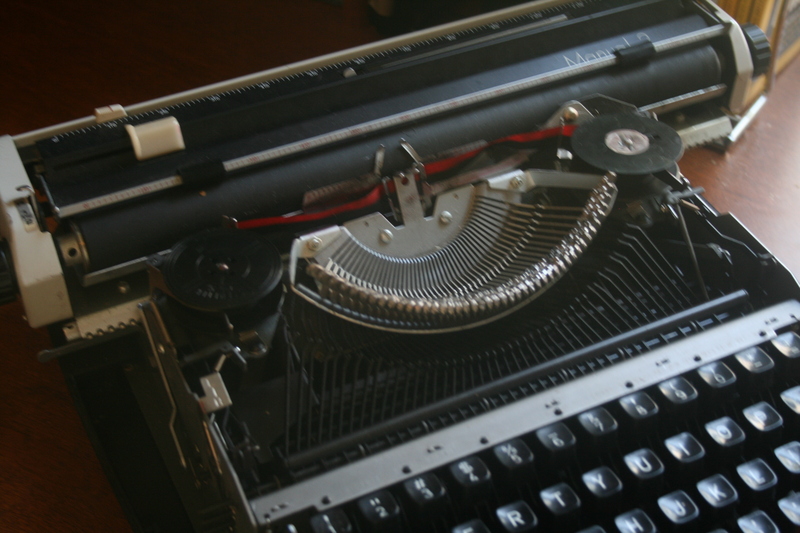 I’ve been obsessed with typewriters for as long as I can remember, but it became a true love when I was around the age of 9. The American Girl magazine came to our house every month and I would spend hours pouring over the pages, and that year they introduced a new doll Kit Kittredge, and a whole new set of books to go along with her. I checked out every Kit book that came out of the library, and immersed myself in stories about the young girl growing up during the Great Depression. Depression-era history was another love of mine, one that would reemerge later when I read Steinbeck’s Grapes of Wrath in my teens. But I’m rambling. The most memorable and enchanting part about the Kit books was the fact that she had a typewriter that she used to write her own community paper. 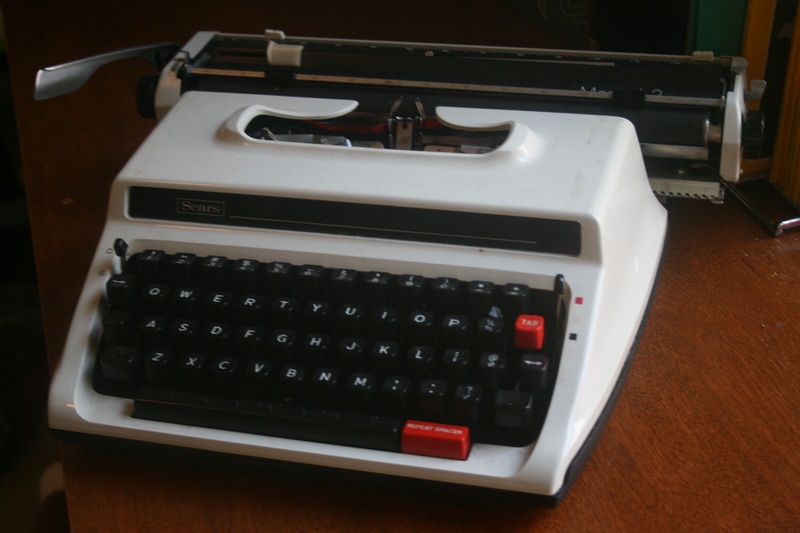 I wanted to be just like Kit, and my mom had an old black Remington typewriter she let me use when I played. I loved to clackity clack in my blanket fort, and pretend that I was a journalist writing my own paper in the Great Depression like Kit. The typewriter ribbon had no ink however, so the best I could get were indentations in the paper that you could kind of read if you held it up to the light. I typed on anyways. 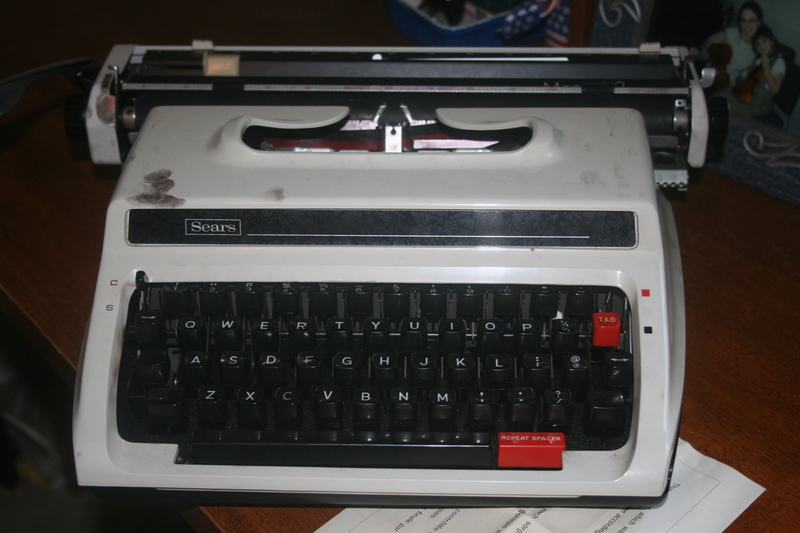 I don’t know what happened to that typewriter, it was probably sold in a yardsale a long time ago, but my love for them continued on as I got older, and I vowed that one day I too would have my very own typewriter, and this time, it would have ink. I guess I had some sort of idealistic vision of myself typing out a masterpiece to the tune of the clackity clack, perhaps while chain smoking and drinking whiskey like the many great authors of days gone by. So when I visited my local thrift store a few months ago, I saw a great black suitcase from across the store and recognized it immediately. Typewriter sized. And when I opened it up, to my joy, it was indeed a typewriter. A more modern version than the one Kit Kittredge or my mother had, but it was a typewriter nonetheless. I bought it quickly, glancing shifty eyed at the other patrons in case they too had an almost freaky obsession with out of date technology and tried to buy my (it was mine as soon as I saw it) beloved typewriter. I got home, set it up, ignored my boyfriends protests of “You’re never going to use that thing!” and “Why do you need a typewriter when you have a laptop!” and quickly realized that like it’s predecessor, it too had a dried out ribbon. So I packed it up, and off to the office supply store we went. I didn’t really know where typewriter ribbon would be in the office supply store, and asking just got me worried looks, but after much looking, I found something that would work. I replaced the ribbon in the middle of Office Depot, but today I took apart my lovely typewriter in order to show my readers how I did it. I’m still not sure if I replaced it right or if there’s a better way to fix the ribbon, but this works and it was cheap and easy. So first things first, you need a typewriter. I have a newer model, the older ones use strictly black ribbon so keep that in mind. 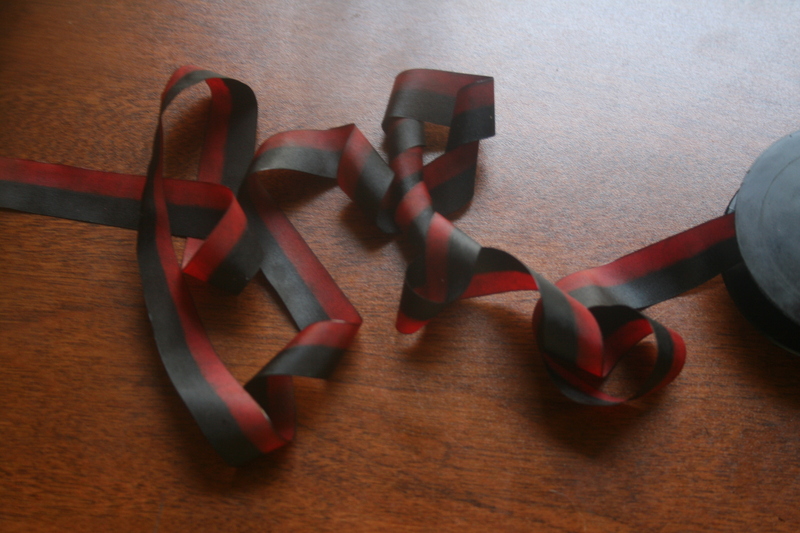 This is the kind of ribbon you’ll need for the newer typewriters. You can find it at most office supply stores, but it’s used for adding machines, not typewriters. It will come on two spools, and the size of those do not matter because you won’t be using them. 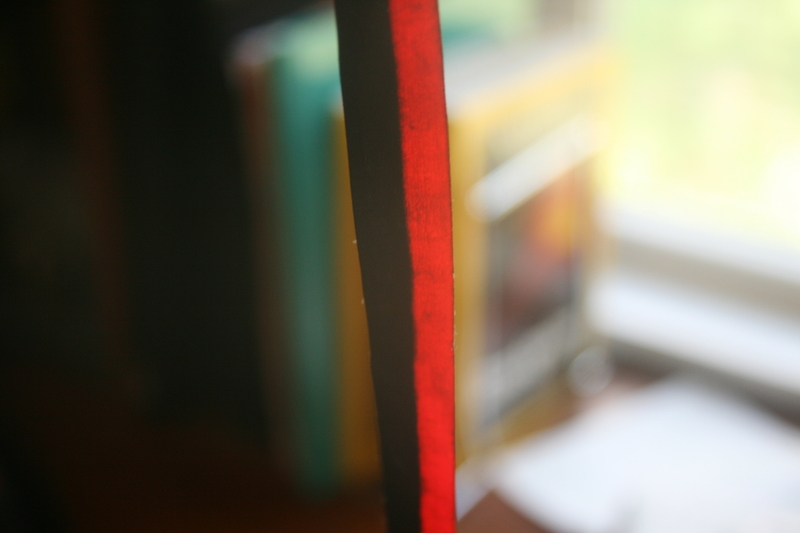 What does matter is that the width of the new ribbon is the same as the old ribbon. If you can’t tell from looking at the package, sometimes the store will let you take it out of the box to check, just ask nicely. Next you’ll take the cover off the top of the typewriter, in order to reveal all those beautiful insides. Easy. 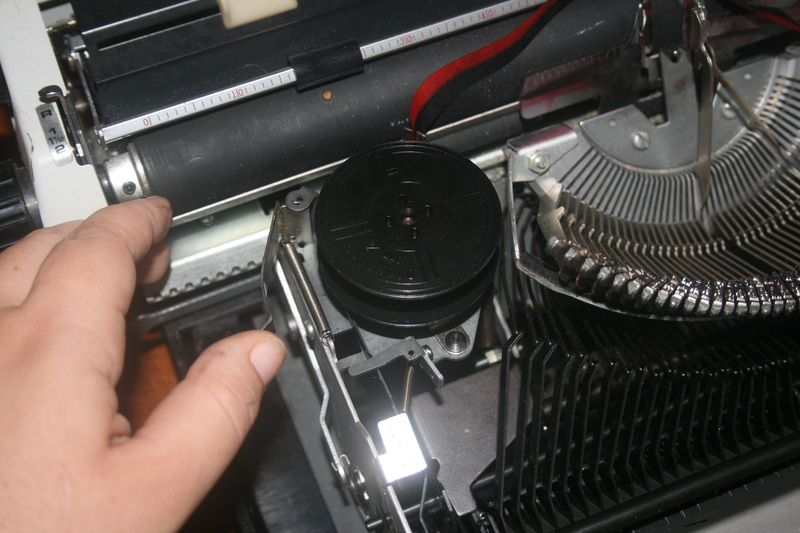 Now, in order to remove the spools, you need to jam the typewriter (press a bunch of keys at once) in order for the ribbon holder thing to come up where you can get to it. Unhook the ribbon from the holder, and remove each spool. 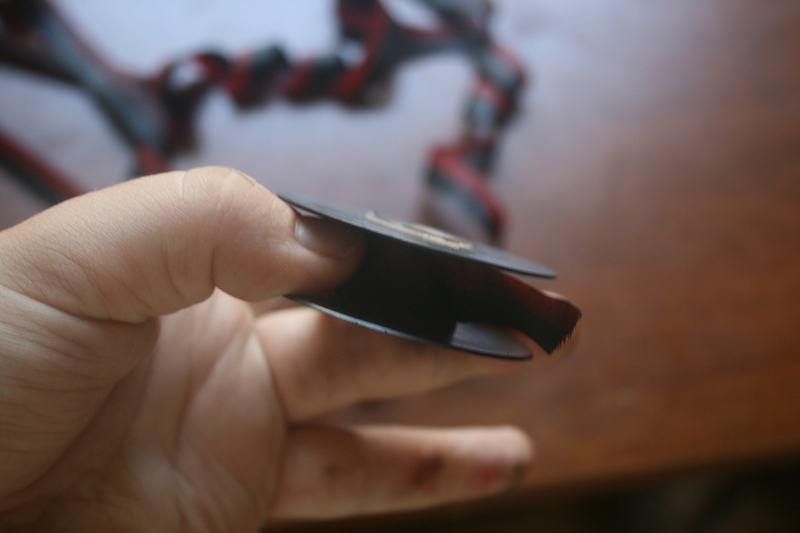 Then you’ll unwind the ribbon and remove it from both spools. Now take your new ribbon (which you’ve unraveled from the other spool it came on), and wrap it around the new one. The best way to do this is to keep the new ribbon on the new spool on one side, that way you only have one lose end at a time. 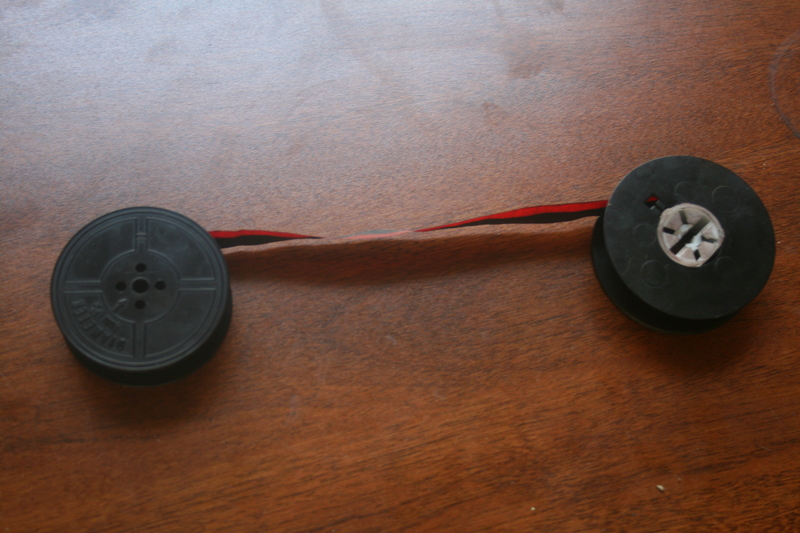 Some spools have little hooks on the inside, and you can hook the ribbon on the spool with those. If this happens, good luck getting it uncurled without yelling a stream of obscenities and scaring your dog. 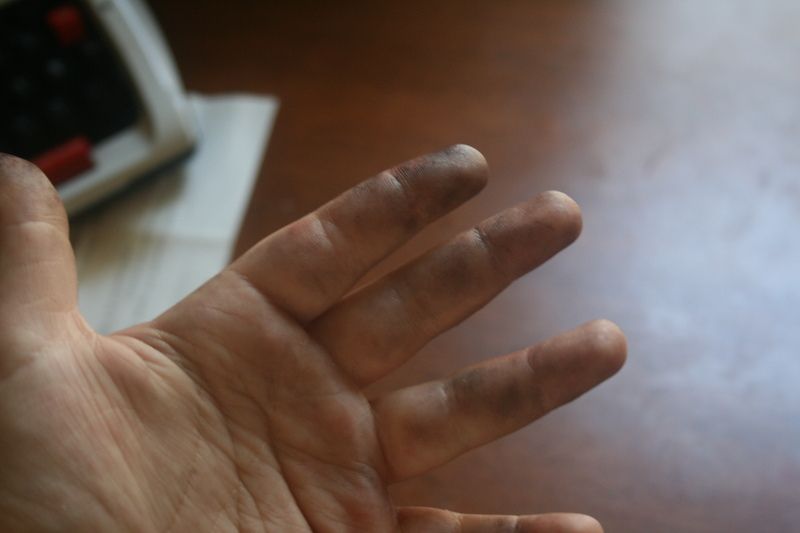 Prepare yourself for inky fingers. Perfect! Now all you have to do is replace the spools and rethread the ribbon into the ribbon holder thing (somebody must tell me the name of that part please! ), and you’re ready to type a new novel. Be sure to wipe off all the inky fingerprints! Of course, after typing a page or two, you’ll probably come to the conclusion that there’s a reason we have computers now, and it’s awfully difficult to type without backspace, spellcheck, or knowledge of how to set up margins. Don’t let this keep you from keeping your typewriter in a place of honor on your desk, even if you only use it at 2 a.m. to type your favorite song lyrics after six glasses of boxed wine. Even if it’s only for the aesthetics and nostalgia, my typewriter will always hold a place in my heart.